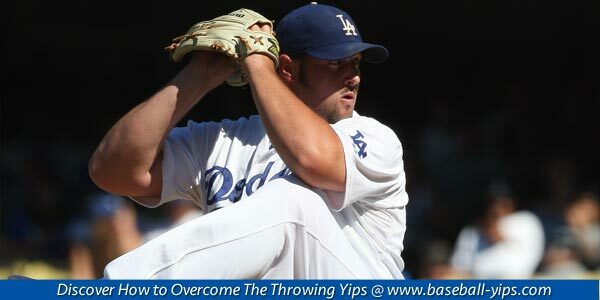 You are here: Home / Baseball Throwing Problem / Does “Tapping” or EFT Help With The Throwing Yips? Emotional Freedom Technique (EFT) works by releasing blockages within the energy system which are the source of emotional intensity and discomfort. An EFT treatment involves the use of fingertips rather than needles to tap on the end points of energy that are situated just beneath the surface of the skin. EFT often works when nothing else seems to. It is usually rapid, long lasting relief from symptoms. Many people have started to use this method for the yips in baseball, golf, and even surgeons. They tap on certain points on the body having to deal with which problem you are having and they begin with a firm tap on certain pressure points which can range from the face, hands, and arms to relieve pressure and can loosen these athletes up and get rid of negative energy. When ball players have the yips they over control their throws and are tight in their motions and tapping is believed to relieve this and help them stay relaxed when they go out and pitch or throw. What do athletes say about “tapping” in baseball? 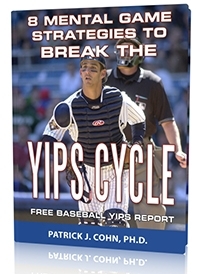 What does Dr. Cohn think about “tapping” to cure the yips? My view is that the yips are primarily caused by fear of failure and more specifically fear of embarrassment. My approach is mostly cognitive/behavioral to help athletes free up their throwing motion and get beyond the fear of making a bad throw and the associated embarrassment and disappointment associated with making a bad throw. Tapping can be effective for some athletes that like this approach. However, some athletes find that tapping alone is too simple and often awkward. How can tapping on your forehead help you improve your throwing control? These athletes often don’t see the relationship between tapping and improvements in their performance. They may view it as a silly, bizarre, or strange method. However, when EFT can be combined with other cognitive strategies that will help free a player from performance anxiety, it can be an effective treatment. 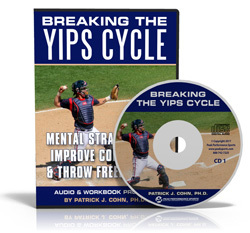 You will find that there are many approached to help ball players overcome the throwing yips. Some approach might fail while others succeed. I did have a golfer contact me about his yips after having tried an EFT to tapping program. He said that tapping did not work for him and he wanted a different approach. However, EFT might work for you if you embrace the process and combine this with other cognitive-behavioral strategies. Personally, I do not use tapping or EFT in my mental coaching with ball players. 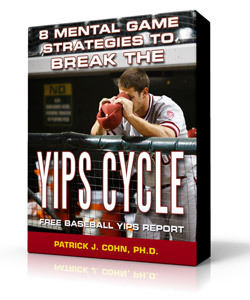 Other mental coaches I know, exclusively use tapping to help players overcome the yips.